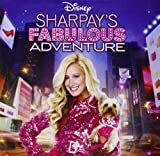 Fabulous (Remix) – Paroles de la chanson dans “La fabulous aventure de Sharpay”. Sortie : 17 mai 2011. Film : La fabulous aventure de Sharpay. Interprétée par Ashley Tisdale et Lucas Gabreel. We’re going to relax and renew. She want fabulous, that is my simple request. All things fabulous, bigger and better and best. She need something inspiring to help me get along. She need a little fabulous, is that so wrong ?